Yaksha and Yakshi are nature spirits. They are usually benevolent mythical beings; and attendees of Kubera, the Lord of Yakshas and Yakshis.They have been depicted in sculpture,paintings and illustrations in India and few countries of Asia. They find place in Hindu, Buddhist and Jain mythology. In Hinduism Yakshas have a dual personality.They could be benevolent and friendly or could be offensive like a rakshasa or demon. Yakshas are believed to be protectors of forests and villages. Yakshas are depicted as strong warriors or as stout,short figures with a big belly. In contrast Yakshis are projected as very beautiful with gentle faces, full hips, rounded breasts and slender waists.The thirty six yakshis who grant desires mentioned in the Uddamareshwara tantra are Vichitra, Hamsi,Shankhini,Kapalini ,Mahendri,Vishala among others. In Buddhist lore, Yakshas are the attendants of Vaisravana. They are the twelve generals who guard Bhaisajyaguru, the Medicine Buddha. They are a main part of the folklore of Thailand and are guardian deities in their temples-gates, the dwarapalas. The yakshis became salabhanjikas holding on to a ashoka tree-branch or a flowering tree depicted majorly at the gates of many Buddhist monuments and Hindu temples. They were associated with fertility and prosperity. In Jainsim the Yakshas and Yakshis are guardian duties around the jinas. Over time they have come to be woshipped too. There are twenty four yakshas in Jainism. Gomukha,Trimukha,Mahayaksha,Yakshanayaka,Tamburu,Kusuma,Dharanendra,Matanga,Vijaya, Ajita,Gomedh among others. The twenty four yakshis include Chakreswari,Ambika,Manasi, Jaya among others. Yaksha Vyala, sculpture,1st century B.C,Government Museum, Mathura. Yakshi,plaque,terracotta, 3-2nd century B.C, Bengal. Yaksha depiction carrying human being,2nd century B.C,Government Museum, Mathura. Yakshi,sandstone,2nd century,Mathura, Indian Museum, Kolkata. Yaksha Gomedh with Ambika,sculpture,11th century,Maharaja Chhatrasal Museum, Dhubela, Madhya Pradesh. Yaksha Gomukha with his consort,sandstone,Gurjara Pratiharas, 8th century, North India. Yaksha Anila, painting on cloth, 15th century,Tibet. Kalpasutra manuscript,15th century,pigment on paper, second image depicts birth of Mahavira watched over by goat headed Yaksha,Naigamesha. Yaksha Thotsakan,Thai Ramakien depiction,mural,18th century,Wat Phra Kaew,Bangkok,Thailand. This entry was posted in art history, asian art, Buddhist art, history of india, yaksha, yakshi and tagged Ancient Indian history, art history, indian sculpture, sculpture, yaksha, yakshi on January 26, 2017 by historyreads. Samudranathana or churning of the ocean of milk is a major event in Indian mythology.The story is narrated in the Mahabharata, Bhagavata Purana and Vishnu Purana. The story is about the origin of amrita, the drink of immortality. Samudramanthana is also called sagaramanthana and ksheerasagaramanthna. Sage Durvasa received a garland from a meeting with kings on earth.He decided to give the garland to Indra, the king of Gods who accepted it, but the moment the sage left he gave it to an elephant who started playing with it. Sage Durvasa came back to tell Indra something and saw the scene; he immediately cursed all the Gods that they will lose their strength and thus they became feeble. Meanwhile Bali, the king of asuras declared war on the Gods. They were very weak and could not withstand them, and defeat was certain.The Gods approached Lord Brahma, Lord Shiva and Lord Vishnu for a solution. Lord Vishnu meditated and only a dose of amrita, the cream of the milk ocean could restore their strength. It was not an easy task to churn the milk-ocean. 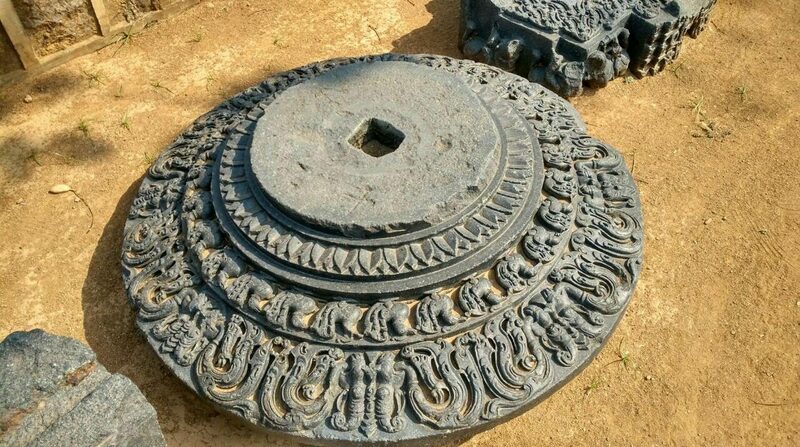 Mount Mandara had to be used as a churning stick which the devas could not accomplish on their own. They needed help from the asuras. Hence an agreement was made between the devas and asuras that they too could drink amrita, after reassurance from Lord Vishnu that the asuras would not get stronger than the Gods. The process was started and Mount Mandara was uprooted by both combined. Many powerful herbs were dropped into the ocean to flavour the nectar or amrita. The Gods then got Vasuki, the serpent who lived in the nether world to churn the ocean as a rope. The Gods had to take the tail end and the asuras took the head end. The asuras became weak by the hot breath of Vasuki. The churning went on and the mountain began to sink into the bottom of the ocean. Lord Vishnu took the avatar or form of a large tortoise or kurma, dived into the ocean and supported the mountain Mandara. As the churning progressed fourteen gems,the moon, the parijata tree, the elephant Airavata, the cow Kamadhenu, Varuni, the goddess of wine, the apsaras, the seven headed white horse Uchchaisvaras, the Goddess Lakshmi, a conch, a mace , a jewel called Kaustubha ,Kalpavriksha,halahala a poison which Lord Shiva consumed, sharanga ,a bow, Nidra or sloth, Jyestha or Goddess of misfortune and finally Dhanwantari , god of ayurveda, emerged who held the pot of amrita. A scuffle followed for the pot and Lord Vishnu appeared in the form of Mohini, a beautiful woman to distract the asuras. They forgot all about the pot and decided to allow Mohini to decide as to who will have the nectar first. The Gods got to drink first but Mohini disappeared with the pot once they had finished ! A fierce battle ensued and the devas or Gods won. As the Gods were drinking the amrita one asura had disguised himself as a deva and had drunk some of the nectar sitting next to Surya, the sun God and Chandra, the moon God. But they detected him and told Lord Vishnu who immediately cut him into two parts. The two parts remained animate because of the effect of amrita and Lord Brahma converted them to two planets in the heavens;Rahu and Ketu. Many versions of this myth exist but they all relate to the churning of the ocean for the pot of amrita. It is also believed that some drops of the amrita fell on four places when the devas had snatched the pot of amrita from the asuras ; Haridwar, Prayag, Nasik and Ujjain. Various depictions of this story have been made in India and countries of Asia over the centuries. Samudramanthana, Razmnama folio, 16th century. Depicted below is another painting on paper of the Samudramanthana episode from an album showing Vishnu as Kurma supporting Mount Mandara with him and seated in padmasana on top. Samudramanthana, Mughal painting, 17th century, British Museum, U.K.
Below is a page depicting Samudramanthana from a dispersed Dasavatara set and/or Bhagavata Purana (Story of Lord Vishnu) from Himachal Pradesh. Below is a watercolour painting on paper of Samudramanthana, this event took place during the second incarnation of Visnu as Kurma, the tortoise. The painting shows Visnu seated on the top of Mount Mandara, here represented as a pole. He holds a discus, sword, conch and lotus in his four hands and has a golden nimbus around his head. The pole rests on the back of Kurma who swims on the surface of the ocean. Around the pole is wrapped the snake Vasuki. On one side the snake is pulled by the gods and on the other it is pulled by the Danava’s. On the shore of the ocean are the objects which have emerged during the churning, which include Laksmi, Varuni, the conch, the elephant mount of Brahma, Airavata, Kamadhenu,the wish fulfilling cow and the vessel holding amrita which bestows immortality on the drinker. A crescent moon is shown in the top left corner of the painting. Samudramanthana, watercolour painting, 19th century. Samudramanthana, 19th century,Swaminarayan temple, Bhuj. Illustration to a ‘Vishnu Avatara’ series,19th century. Below is a detailed painting on paper depicting the Samudramanthana episode. At the centre of the composition is mount Mandara, identified by an inscription in English. As usual in South Indian painting, at the top of the mountain a temple’s golden kalasha is visible. Just above it, Vishnu is emerging half bust from a cloud, carrying the amrita vessel in his hands. The densely forested Mandara, inhabited by gandharvas playing musical instruments, rests on the Kurma, duly identified by an inscription: ‘Kurm raja‘. Coiled around the mountain is the serpent Vasuki, identified as ‘Vasuka’, whose tail end is held by the dikpalas, here identified as ‘Asuras‘ and the head by the asuras, here labelled ‘Suras‘. Both dikpalas and asuras stand in the ocean’s water filled with fish. The dikpalas are headed by Indra easily recognizable by the vajra in his hand and by the thousand eyes on his body. He is followed by the two-headed Agni, the bushy-moustached Yama, and by Nirriti, Varuna, Vayu, Kubera, Ishana, Surya and Candra. On the opposite side are nine asuras, enveloped by the dark fumes spewed out by Vasuki. In the foreground are the many precious objects which emerged from the depths of the sea: the horse Uchchaihshravas, here depicted with only one instead of the usual seven heads, the white elephant Airavata, the fire, the tulsi plant, a chariot, the goddess Lakshmi seated on a lotus , identified by an inscription: ‘Lakshmee, goddess of abundance’, the parijata tree, Surabhi, Soma, a portly man seated on a throne carrying a book, identified by an inscription as ‘Daruma god of water’, possibly Varuna, five precious stones, yet another tree, possibly the kalpavriksha, the apsaras, one of whom, Tilottama is immediately carried away by the asura brothers Sunda and Upasunda, and finally a goddess with a broom, possibly Jyeshtha or Alakshmi, sister of Lakshmi and goddess of misfortune. It should be noted that the list of the objects retrieved from the ocean varies according to the texts. The variety presented here is especially large, as it includes the throne, the fire, the tulsi, the chariot, and last but not least Alakshmi. It is also unusual to find the story of Tilottama, Sunda and Upasunda hinted at in this context. Yet another remarkable feature is the presence of Varuna (?). It is generally Varuni the goddess of wine who appears in the renderings of this incident, and another strange omission is that of Dhanvantari, the physician of the gods, who appears with the amrita vessel in his hands. As noted above, in this painting it is Vishnu who carries the amrita to the devas. In the left upper corner of the painting Vishnu as Mohini, identified by an inscription ‘Narayana’, is doling out the amrita to the assembled gods seated opposite the asuras. While she is busy, she is distracted by the asuras clamouring for their share. In that moment, Rahu seated among the devas, and anxious to get his share of amrita, is discovered and decapitated by Vishnu’s chakra. The story continues in the upper right corner: the gods and the asuras are engaged in a fight, and immediately to the left, Śhiva swallows the halahala poison, shown as a blue line on his throat, under the watchful gaze of the gods and Parvati. Samudramanthana, detailed painting, 1820s, South India,British Museum, U.K. This entry was posted in art history, samudramanthana, Surabhi and tagged Ancient Indian history, art history of India, mahabharata, samudramanthana, sculpture on January 25, 2017 by historyreads. Kamadhenu or Surabhi is the divine, wish fulfilling bovine goddess, mother of all cows in Hindu mythology. She is wish-fulfilling and can grant desires. She is depicted as a white cow containing various deities within her body. As per the Mahabharata she emerged from the churning of the ocean or samudramanthana in order to acquire amrita for the saptarishis, or seven sages. She was ordered by Brahma to give milk for yagnas. Kamadhenu is also said to belong to sage Vashista;provides milk to her sage-masters and warriors if needed. In another part of the epic the Anushasana parva says that Surabhi was born from the belch of Daksha after he drank amrita. Surabhi or Kamadhenu gave birth to many golden cows, the kapila cows who were called the mothers of the world. The Udyoga parva says Brahma drank too much amrita and some of it was split out from which Kamadhenu emerged. The Ramayana calls Surabhi or Kamadhenu as the daughter of sage Kashyapa and his wife Krodhavarsha, the daughter of Daksha. But as per the Puranas, Kamadhenu is the daughter of Daksha and the wife of Kashyapa.The Harivamsa, an appendix of the Mahabharata, calls Kamadhenu, the mother of amrita,,Brahmins, cows and Rudras. As per the Devi Bhagavata Purana Krishna created Kamadhenu when Radha and Krishna were thirsting for milk. A calf Manoratha was created from its left side; the milk pot from which they were drinking fell and spilled which became the Ksheersagara, the cosmic milk ocean. Kamadhenu is believed to reside in Goloka, the world of cows and the netherworld, Patala. Nandini, Shabala are said to be her daughters or other names of Kamadhenu. Kamadhenu is the sacred cow and a form of the Devi and a source of prosperity. Many Gods are believed to reside in the body of Kamadhenu and she is often depicted as such; the trinity of Brahma, Vishnu and Shiva are on her forehead,her four legs are the Vedas, shoulders the fire God Agnin and wind God, Vayu, eyes are Surya and Chandra, the sun and moon God, her legs are the Himalayas. In another reresentation she has the body of a white cow, a woman’s head with a crown, an eagle’s wings and a peacock’s tail. She is also shown accompanying Dattatreya and represents the pancha bhuta or five elements. Kamadhenu, possibly Karnataka, 15th to 17th century, Nelson-Atkins Museum of Art,Kansas City, Missouri,USA. Kamadhenu with Uchchaisravas,the horse and the parijata tree, painting, 18th century,Philadelphia Museum, USA. A beautiful depiction of Kamadhenu in art is shown below; a painting of a rishi(sage), the parijata tree and Kamadhenu.The sage sits in an architectural frame, seated on a tiger-skin and with yogabandha. In his right hand he holds a rosary. To his right are his water-pot and staff while to his left is a lotah with bilva leaves. In the centre of the page is the parijata tree, with many different types of leaves and flowers. To the left, is the wish-fulfilling Kamadhenu or Surabhi. It has a female human crowned head, the body of a cow (with anklets), wings and a peacock’s tail. Kamadhenu with a rishi and the parijata tree,painting, 1820. Kamadhenu, Illustration,Mahabharata, probably early 20th century. This entry was posted in Ancient Indian history, art history, Kamadhenu, Surabhi on January 24, 2017 by historyreads.